Let us take your relationship with your dog to the next level. Living with your dog should be a rewarding experience, not a frustrating one! Let us help you enjoy your furry family member and take the frustration out of training. Our intensive, exclusive, program will teach your dog how to be a well-mannered family member. 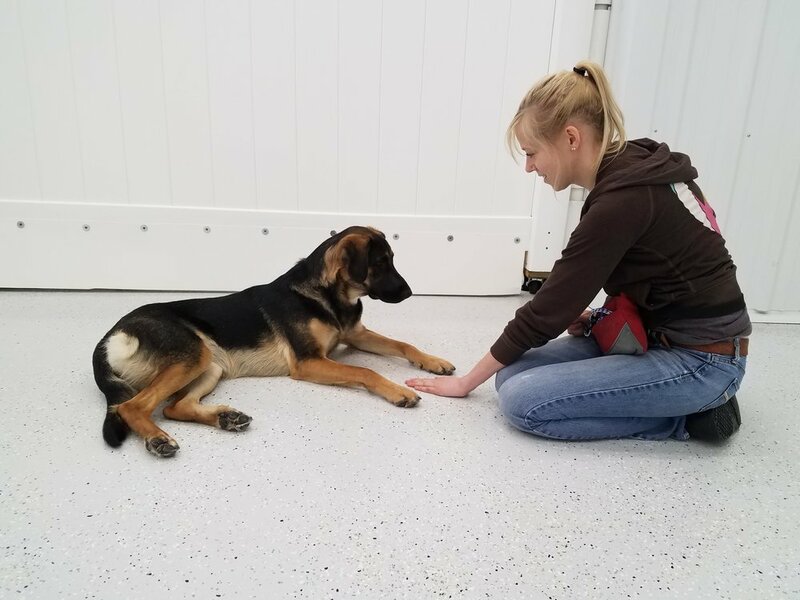 We can work on basic and advanced obedience, common behavior issues, crate training and more! A 60 minute in-person consultation to develop the customized training program that suites your dog's needs. One "Real World Adventure" - an off-site excursion for you and your dog to work on your skills in a small group setting with our trainers in the real world! Possible locations include bar/restaurant patios, hiking trails, open fields, and the Waterfront Trail. 20% off group classes with Dog Owner Coach. Access to our VIP Training Client Only Facebook Group where you can ask our trainer questions and get feedback plus updates on your pup's progress. A follow-up video and Parent-Teacher Conference detailing what your dog has learned and how to continue building on their new behaviors at home. Want to learn more? Request a free phone consult to see if the program is the right fit for you and your pet. Ready for a well-behaved pooch? Request your VIP Program Consultation to begin your personalize training program. Below are the most common behaviors/skills we can work on, but don't hesitate to ask about other training that you and your dog may be having trouble with; we can tailor specific activities and training to your needs. RECALL: The number one problem presented to trainers! A dog who doesn't come is a dog who finds greater reward in other things than they do their human. Let's change that! We'll teach your pup that returning when called is worth their while. EMERGENCY RECALL: When "come" just won't do. An uncommon word is chosen and your dog will go through several drills to learn that this word always means an immediate recall. Great for off-leash dogs or wanderers! CRATE TRAINING: The crate is an invaluable tool for any dog owner! It gives them a safe, quiet, comfortable, personal place to relax while keeping them out of mischief. We set the stage for your crate training at home with fun, positive training. LOOSE LEASH WALKING: We'll get your dog walking at the pace you set with a combination of proper equipment (properly fitted collars, front clip harnesses, head halters, etc) and training. MUZZLE TRAINING: Get rid of the misconception that muzzles are for "bad" dogs. A basket muzzle helps your dog make better decisions using their brain instead of their mouths (whether it's putting their mouths on people, dogs, or unsafe objects). We make sure the muzzle is a VERY positive experience and is NEVER a negative association! LEAVE IT: Great for puppies, hounds, and other impulsive pups. Stop your dog from jumping or diving for things they shouldn't get! NUISANCE BARKING: Can’t hear over the sound of your dog’s opinions? Barking is a lot like a sneeze: it’s tempting to treat the symptom first, but we’ll develop a training program that addresses the cause first. Let’s figure out what your dog is trying to say and give him a different way to communicate! UNINVITING JUMPING: It’s natural to want to reward a puppy or small dog for jumping up to greet us, but this can quickly become a problem as they grow. We’ll discuss the best methods and come up with a game plan to help your pup keep all four on the floor! MOUTHING: A dog’s mouth is their foremost form of communication and interaction, and while it’s perfectly acceptable to interact with their canine friends this way, this isn’t always considered polite behavior to show humans. Let’s teach your dog how to put his manners where his mouth is! CHEWING/DIGGING/SHREDDING: When a dog is bored - especially the busier breeds - they tend to make up their own jobs. Let’s talk about what makes your dog feel destructive and get him feeling employed!